In late November of 1915, a slick-tongued stranger came to No. 10 Township (Midland area) and Bost Mill. He represented himself to be the agent of a large poultry concern in Danville, Virginia and was looking to buy all the turkeys the farmers would sell: and so began the great Cabarrus turkey scam. The stranger identified himself as E. S. Bowen. After securing lodging, he began making the rounds with a wagon and driver to the area farmers. Bowen hired one of the farmers to make crates to hold turkeys. 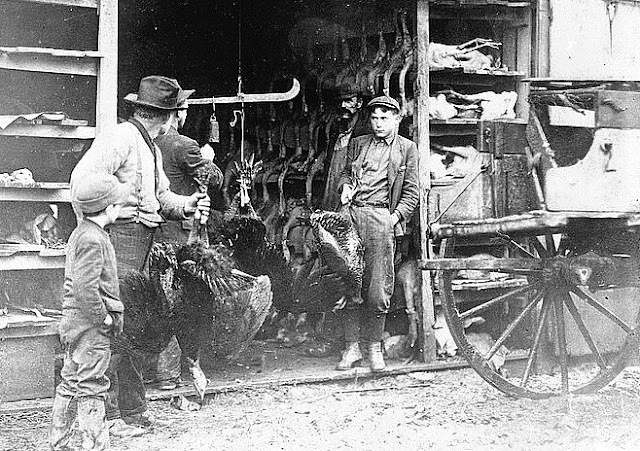 The going rate for turkeys was 15 cents a pound, and many of the farmers had already committed their birds to area sellers for the holiday season. Bowen said he wanted the birds for his Danville connection and would make it worth their while. He said they had provided him with a big checkbook and he would be able to pay much more than the going rate at markets in Concord and other places, so why not sell to him? Bowen began manipulating the market to bump up prices. The result was that the price of turkeys in No. 10 Township, as well as in Concord and other nearby markets, suddenly went up to a 17 and 18 cent per pound minimum. The news of the high prices spread all over southern Cabarrus and the turkeys were sold in such numbers that Bowen soon purchased about $800 worth. "They only pay 15 cents a pound. They are my turkeys, my means of making Christmas money and buying a few extra things and I am going to sell for 17 cents." She did sell them for 17 cents and accepted a check for $66. Many others did as well. It was expected that Christmas money would be plentiful as there were an unusually large number of turkeys. Bowen convinced everyone he was good for the purchase because he would take one of the No. 10 farmers to Danville and show him the place where the turkeys were prepared for market. Additionally, a prominent well-known farmer was letting him take his team [of horses] to haul in the turkeys. Bowen and the unnamed farmer made the trip, but after arriving in Danville, Bowen became unusually busy. After spending a part of a day looking after various matters, Bowen informed the Cabarrus citizen that it was necessary for him to make a trip to another town, and so the Cabarrus man returned home. Soon after the Cabarrus man's return, the checks began to bounce. They were marked "No Account Here" by the First National Bank of Danville. Needless to say, none were too happy. They retained the service of T. D. Maness, a local lawyer to track down Bowen and bring him to justice. By all accounts, efforts proved unsuccessful and there was no trace of "Bowen" or the destination of the turkeys. Not everyone was sympathetic with the scam victims, for it was felt they had gotten what they deserved for being greedy and reneging on commitments to local buyers. Now everyone would have to suffer without turkey for Christmas. The Tribune further reported that not since a photographer "passed through a certain section of the county, took a number of pictures, collected money for them and then departed to "return no more" had such a 'skin game' been pulled off in the area." In the second half of the nineteenth century, America was flooded with new immigrants. These new immigrants, especially the millions of Irish fleeing Ireland’s potato famine of 1846, helped to popularize the celebration of Halloween nationally. Its origins date back to the ancient Celtic festival of Samhain and the All Saints Day celebration called All-hallows or All-hallowmas. By the late nineteenth century, there was a move to mold Halloween into a holiday more about community and neighborly get-togethers than about ghosts, pranks and witchcraft. Halloween parties for both children and adults became the most common way to celebrate the day. Parties focused on games, foods of the season and festive costumes. Hostesses enjoyed creating unique and elaborate celebrations. 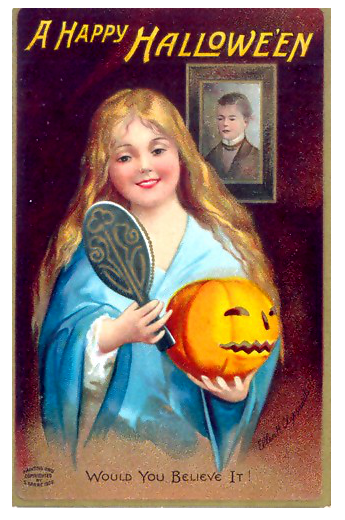 Of course Jack O'Lanterns glowed from every nook and corner. Refreshments were often mulled cider, grapes, apples, and nuts while a "dutch lunch" was served at midnight. 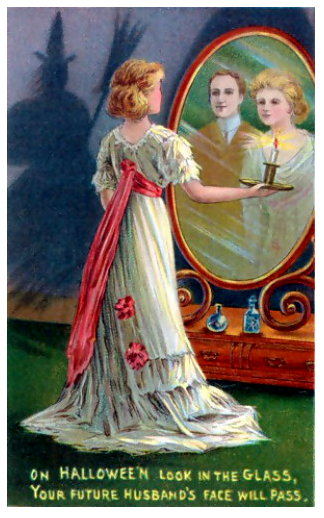 This was typically bread, coffee, cold meats and cheeses.Young women also believed that on Halloween they could divine the name or appearance of their future husband by doing tricks and telling fortunes. On Saturday, October 29, 1904, Miss Anna Belle Barrier of Mount Pleasant had just such a party. 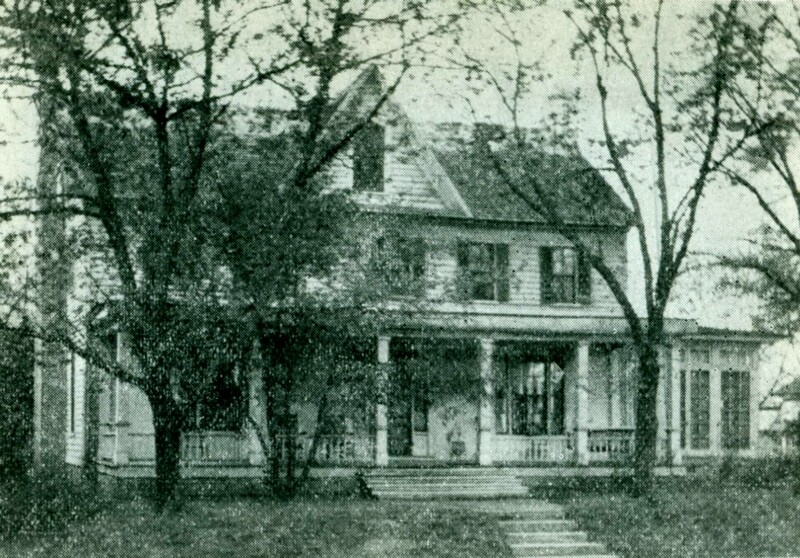 According to the October 31 issue of the Concord Daily Tribune, she had "quite a large number of young people gather at her home...The early part of the evening was filled with a mingling of weird ghost stories and the merry voices of players as they frantically yelled, 'Robber,' 'Thief,' 'Burglar,' etc." in a game of Sherlock Holmes. "As the wee small hours began to draw near a professional fortune teller was produced, and today a score of young ladies are rejoicing in the fact that they know precisely whom they are going to wed."Miss Bessie Heilig and Miss Jennie Cook followed with other parties on Monday the 31st. The Concord Daily Tribune on October 30, 1906 suggested other Halloween matchmaking games such as mystery cake, three bowls, and the candle fortune. For mystery cake, tiny white bags were to be inserted under the icing containing flour, which indicates a rich marriage; sugar for love; cornmeal meant that you will have to work for a living; and an empty bag foretold single blessedness for the next year. The cake was cut by drawing lots and cutting the first slice was considered a great honor. For the bowl game, three bowls were placed on a table, one filled with water, one with milk, and the other empty. Each young lady was then blindfolded, turned around three times and faced toward the bowls. If she put her finger in the water she will marry a bachelor, in the milk she will marry a widower, and if her finger touches the empty dish she is fated to remain single. For the candle fortune, lighted candles were to be placed in an open window. The one which burns the longest is the one who will remain faithful to the end. Of course the candles are named before being lit. 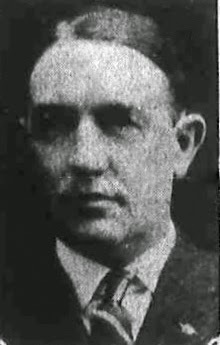 It is not known if Anna Belle Barrier's fortune came true, however she did marry North Carolina lawyer Willard M. Axley in Spokane, Washington in 1912. She was the daughter of Paul A. Barrier and Mary Cooper Bangle. 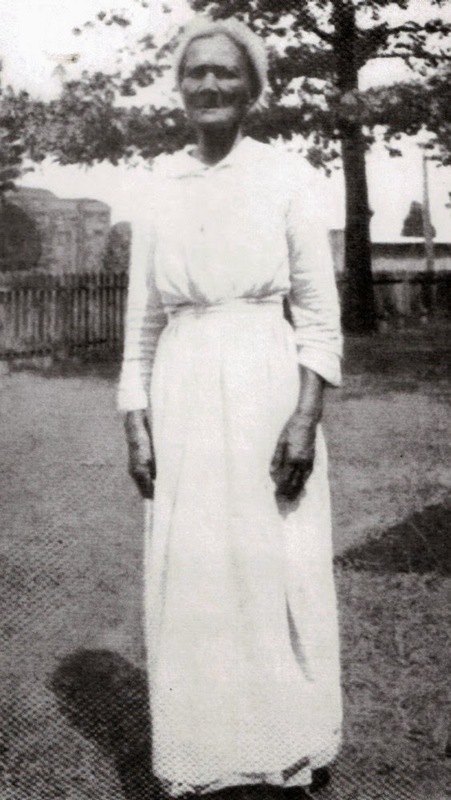 By 1920 Anna Belle and Willard returned to North Carolina and settled in Murphy, Cherokee County where they remained with their daughter Ellen. The following contains excerpts from Gail Jarrow's book Red Madness:How a Medical Mystery Changed What We Eat and her website http://www.gailjarrow.com/pellagra.html. Pellagra struck all age groups. Between 1900 and 1940, at least 100,000 individuals in the South died of pellagra, or "black tongue," a dietary deficiency disease. The accelerated rise of pellagra was especially difficult in farming and mill communities. 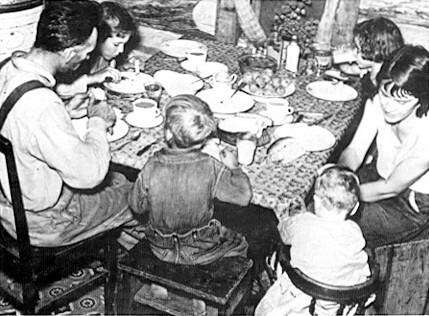 Its effects were felt in Cabarrus County as workers struggled to feed their families during times of economic hardship. The July 6, 1911 Charlotte Observer reported that "Mr. J. D. Bost, a well-known and popular young man of the city [Concord], was taken to the Charlotte sanatorium this morning to be treated for pellagra. Mr. Bost's health failed several months ago and and it became necessary for him to resign his position as book-keeper... and since that time he has been in a sanatorium for treatment but the cause of his illness was not generally known." 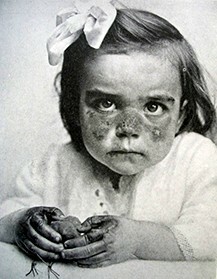 Also called Italian leprosy and Alpine scurvy, the first reported U. S. case of pellagra was in 1902 when a young Georgia farmer sought a doctor’s help. The man felt too weak to work. He vomited when he ate. His skin was covered with blisters and crusty scabs. The doctor was shocked when he realized his patient appeared to have pellagra, a dreaded disease from southern Europe. Pellagra was known for its 4-D symptoms: dermatitis (a red rash), diarrhea, dementia (insanity), and death. The affected tissue would darken, thicken, and become scaly; cases were sometimes misdiagnosed as leprosy. Symptoms would increase with sun exposure and could progress to depression, stupor, and an irrational violence. Recognized in Europe since the 18th century, no one was sure what caused pellagra or how to cure it. It made its first appearance in North Carolina near Wilmington and by 1907 there was one reported case in Cabarrus.2 Physicians were worried but not yet taking it seriously. Then the federal census bureau's death registration for 1910 reported that North Carolina led the country in pellagra mortality with 368 deaths, 263 (71.5%) of which were female. The largest numbers were in Raleigh (23); Durham (17); Charlotte (16); and Wilmington (8).3 Many went mad as the illness attacked their brain, and about 30% died. As the disease crossed the South, people panicked. Although there were only four reported cases in Cabarrus by 1912, nearby Mecklenburg had 156.3 As the number of cases continued to increase, concerned doctors said it was second only in importance to tuberculosis. Annual deaths in North Carolina peaked at 1,015 in 1930. The yearly total stayed well into the hundreds through the Depression and beyond; it did not fall to double digits until 1944. Some thought it was caused by defective corn imported after the Civil War or food made from old or fermented corn. People stopped eating corn bread or anything made with corn meal. Since it seemed to run in families, was it hereditary? Was pellagra spread by an insect carrying a dangerous microbe? Was it contagious, passed from a victim to everyone around him? diets of Southern tenant farmers and mill workers. The United States Public Health Service was determined to find the answers. The Surgeon General appointed a skilled epidemiologist to lead the investigation. In 1914, Dr. Joseph Goldberger headed to the South in search of clues. Goldberger noticed more cases of pellagra among certain groups of people—sharecroppers and tenant farmers; cotton mill workers; children in orphanages; prisoners; and patients in insane asylums. After careful observations, he formed a hypothesis: Pellagra was caused by a diet high in corn and cereals and low in animal-protein foods (meat, eggs, milk). By 1916, Goldberger had proved that pellagra was caused by a diet deficiency, but he didn’t know exactly what crucial element in food prevented the disease. Despite years of searching, he died in 1929 before anyone discovered the final solution to the mystery. In 1937, Conrad Elvehjem, a biochemist, identified that missing element—nicotinic acid, now known as niacin or vitamin B3. Later research showed that the amino acid tryptophan, found in high-protein foods, also prevents pellagra because the body is able to change it into niacin. 1. Kevin Kinsella, "Changes in Life Expectancy, 1900-1990," The American Journal of Clinical Nutrition, 1992;55:1 l96S-1202S. It's fascinating to see how far we have progressed over the past 125 years or so when it comes to the field of dentistry. When Dr. William Cyrus Houston set up his practice as the third dentist in Cabarrus County history on April 8, 1890, it was a crude and painful business by today's standards. Located in Concord, Dr. Houston rented the rooms on the second floor over what was then Misses Benson & Fisher's millinery store at 14-1/2 South Union Street (now Angela's Gift Boutique), and spent all of his 54 years of practice in the same office. The only other dentist practicing in Concord when Dr. Houston arrived was H. C. Herring. In a 1964 newspaper article, Dr. Houston recalled that those were the days before local anesthesia. In fact, at that time, general anesthetics were almost never used by dentists. He described his patients as "hardy people." It was reported that he winced when telling the story from the early days when he once pulled 27 teeth from one woman at one sitting without using anesthetic. "That was bad judgement; I realized that later," he said. "I never would pull more than six teeth at a time after that." He also confessed to not having a license to practice when he first started. About 1895, local anesthetic--cocaine--came into wide use among dentists, but many people were suspicious of its use. He said, "They got it in their minds that the anesthetic was what made their teeth hurt afterward." The disadvantages of cocaine soon became self-evident. Fortunately, less toxic local anesthetic drugs were developed. Dr. Houston pioneered the use of electricity in the dentist's office in Cabarrus County when he returned from the Chicago World's Fair in 1903 with a newly-developed electric motor. He previously had used pedal power, and then a water motor to operate his drill. There were no laboratories in the early days to make plates for dentures. He made his own using rubber. Dr. Houston was born in Monroe, Union County in 1867, son of Benjamin Franklin Houston and Mary Elizabeth Hudson. He enrolled at Bingham Military School in Orange County at age 17. After leaving the academy, he clerked in a grocery store for a year and then studied dentistry under his second cousin, Dr. W. B. Houston of Monroe. David Franklin Houston, brother of W. B. Houston, was Secretary of Agriculture and Secretary of the Treasury under Woodrow Wilson. W. C. Houston then attended Vanderbilt University and received his degree in dentistry in 1890. He came immediately to Concord and opened his office where he practiced until his retirement in 1944. 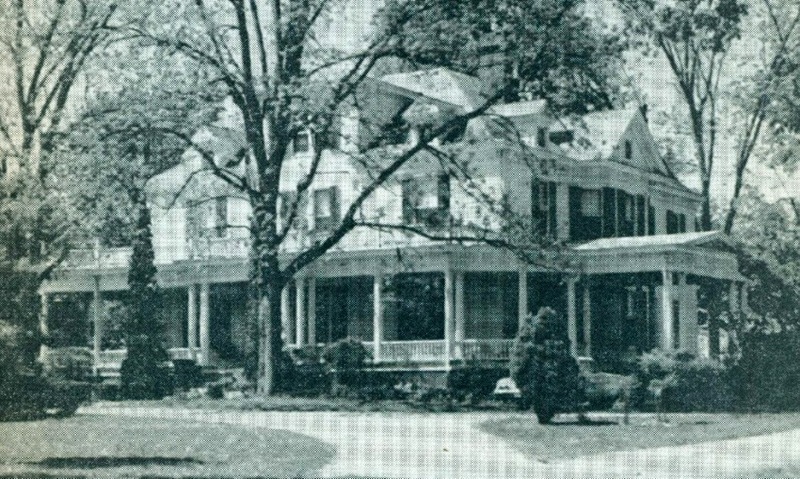 In 1893 he married Nina Adams, also of Monroe, and 10 years later they bought the oldest, most historic house in Concord. 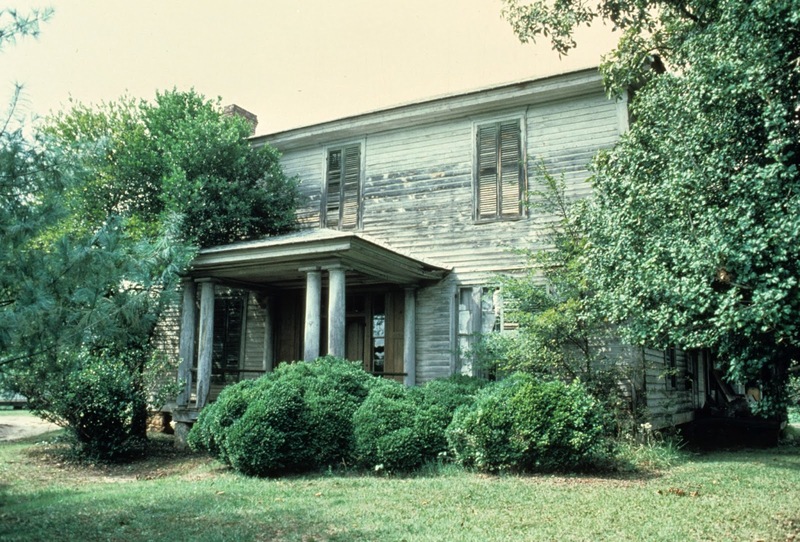 Called the Victor Barringer home, it was widely known as the one in which Jefferson Davis spent a night during his journey south following the surrender at Appomattox. in Concord, last owned by Dr. W. C. Houston and his wife Nina. Photo courtesy of the Concord Library Lore Local History Room. Bottom: Marker in front of the Concord library. Other renown historic figures had been entertained in the home, among them Revolutionary War hero Marquis de Lafayette and founding father Thomas Jefferson. Sadly, the home was later demolished and is now the site of the Concord Public Library. 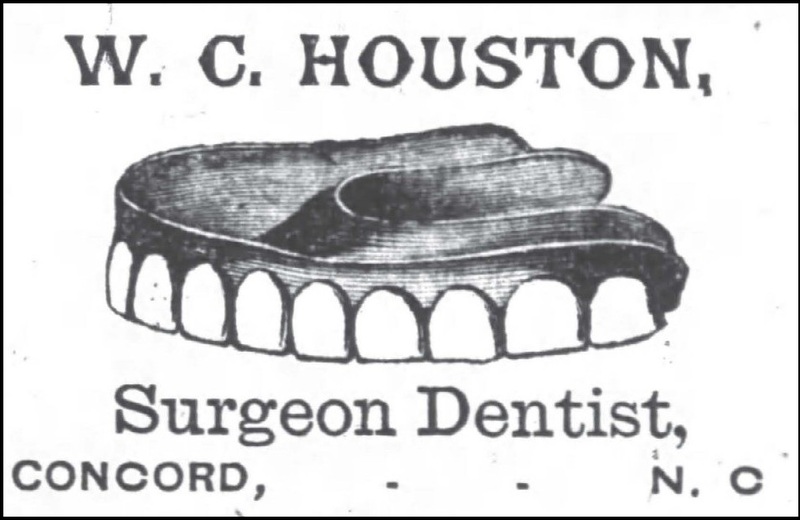 In addition to his dental practice, Dr. Houston maintained substantial farm and business investments. Throughout his career, he was on the board of directors of of the Cabarrus County Savings and Loan, Concord National Bank, Concord Telephone Company, and Kerr Bleaching and Finishing Works. 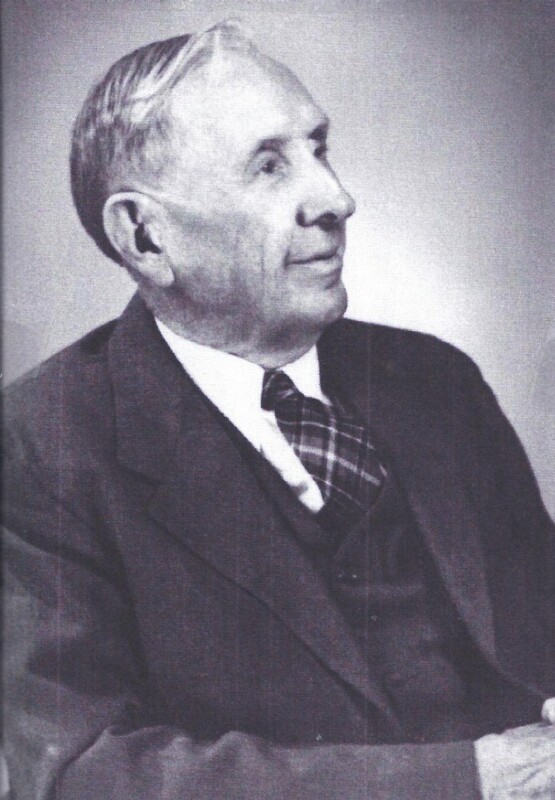 In 1948 he founded the Houston Preaching Mission. Dr. W. C. Houston died in December of 1965 at the age of 98. He and Nina never had children. They are buried in Suncrest Cemetery in Union County. Headline of The Concord Times, June 19, 1916. During the early 1900s, the United States found herself with a very uncomfortable neighbor to the south. The violence of Mexican revolution frequently spilled across the border into Texas and New Mexico. After Mexican bandit and general Pancho Villa deliberately killed over 30 Americans and burned Columbus, New Mexico, President Woodrow Wilson called the nation's militia to arms. 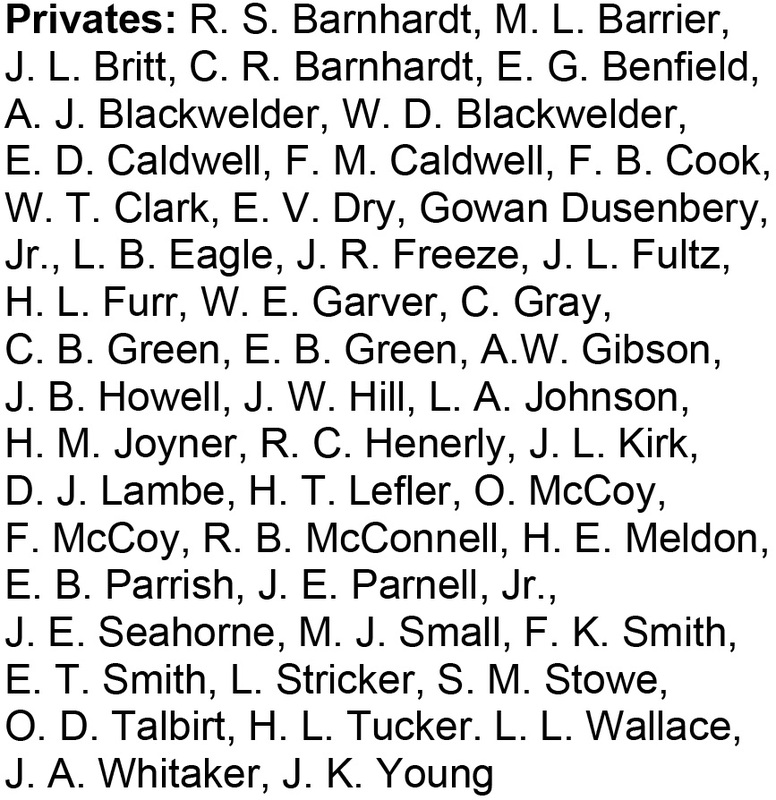 In June 1916, Company L of Cabarrus County assembled for the trip to the Mexican border. The 65-man National Guard unit quickly recruited the additional manpower needed to meet war strength of 142 men. On Saturday, June 24, Company L departed by train for Camp Glenn, Morehead City, NC, to be placed under the 1st North Carolina Infantry, Colonel J. T. Gardner commanding. By September, Company L was camped at El Paso, Texas for border patrol. Luckily, Company L was able to return home to Cabarrus on February 8, 1917, where they found a big homecoming awaiting them. 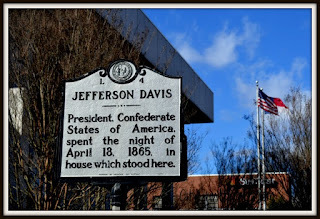 According to the Concord Times, they arrived by train at 3:00 a.m., but remained on the train until 8:30 a.m. and then marched to the court house where they were met with a large reception and parade. Unfortunately, the worsening war in Europe again forced Company L to recruit to full war strength in March of the same year. The below photograph of Company L was taken on July 20, 1914, two years before their Mexican border action and three years before entering World War I. It shows the company assembled on the side steps of the Post Office building (corner of S. Union and Foard Streets), facing Foard Street. The only man positively identified is company artificer (blacksmith who makes fuses, shells, grenades and other armaments) John F. Barnhardt, fourth from left, front row. The man in front of Company L is probably Captain Louis A. Brown, president of Brown Construction Company, the building seen at top right. Cabarrus County National Guard Company L. Photo taken July 20, 1914, donated by John C. Barnhardt, courtesy of Concord Library, Lore Local History Room. Patent No.377,656 baseball bat drawing by Dr. John W. Moose, filed 9 Sep 1887. Be it known that I, John W. Moose, a citizen of the United States, and a resident of Mount Pleasant, in the county of Cabarrus and State of North Carolina, have invented certain new and useful Improvements in Base-Ball Bats; and I do hereby declare that the following is a full, clear and exact description of the invention, which will enable others skilled in the art to which it appertains to make and use the same..."
Dr. John Wesley Moose of Mount Pleasant had an idea to improve upon the wood baseball bat. In the 1860s, there were almost as many types of baseball bats as there were baseballs. And like early pitchers, who made their own balls, early batters were known to sometimes whittle bats to suit their own hitting style. For many years there was room for experimentation: some bats were flat on one side and some were hook-shaped rather than straight. In 1884, the most famous name in baseball bats made its debut when 17-year-old John A. “Bud” Hillerich took a break from his father’s woodworking shop in Louisville, Kentucky and created an all-wood bat which became known as the Louisville Slugger. 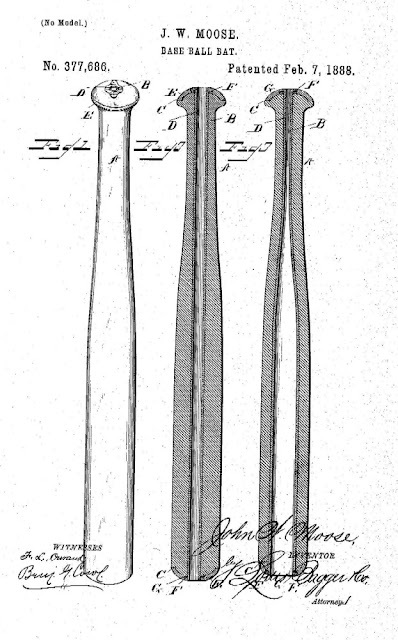 Although it eventually set the standard in the industry, the all-wood bat was never patented, but became what is known as a patent prior art: all baseball bat patents are on inventions that improve or change the bat - and the very first was that of Dr. Moose's hollow core bat in 1888! With his application, filed on September 9, 1887, Dr. Moose made a trip to New York City, where he went in the interest of his baseball bat. Dr. Moose claimed that his new invention was "everything that a professional player could wish." By creating a bore throughout the length and inserting a metal tube, the intention was to provide a means in which bats could be strengthened without adding weight. His hope was "that it wouldn't be long before it would be on sale so its merits could be tested." (a) The bat shall be a smooth, round stick not more than 2.61 inches in diameter at the thickest part and not more than 42 inches in length. The bat shall be one piece of solid wood. The decision by professional baseball to stay with the solid wood bat disqualified Dr. Moose's bat, but the baseball bat was not Dr. Moose's only patent. On April 27, 1888, The Concord Times reported that "Dr. J. W. Moose left on last Monday in the interests of his patent for managing kicking horses and mules." The invention intended to confine the movements of the hind legs of an animal to keep them from kicking. The entrepreneurial John Wesley Moose was born 7 Feb 1853, the second of nine children to George and Elizabeth "Hannah"(Moody) Moose in Stanly County. He graduated from North Carolina College (later Mount Pleasant Collegiate Institute) in 1877 and from the college of physicians and surgeons in Baltimore in 1879. He returned to Mount Pleasant and opened a practice located in the H. C. McAllister & Co. Drug Store. In 1882 John married Rosa Wadsworth, then a teacher at Mont Amoena Seminary, and built a home on Hwy. 73 just east of Main Street. John and his brother Archibald Walter Moose also founded the A. W. Moose Drug Co., initially located on the corner of E. Franklin St. & S. Main St. In 1888 John and Rosa's young family intended to follow other Moose family members to Texas, but the plan had to be postponed when Rosa suffered from a severe case of typhoid fever. The following year, they made the trip with a newborn baby and settled in Parker County, Texas. There they remained and Dr. Moose continued to practice medicine for the next 30 years, until his death in 1919. Although professional baseball did not adopt Dr. Moose's baseball bat, his is the first in a long list of composite and hollow-core patents: No. US377686 is the first one cited in all subsequent applications. Concord coal and ice distributor A. B. Pounds. On October 26, 1933, well known businessman A. B. Pounds, age 53, was found shot three times in the office of his former ice plant in downtown Concord. One of Concord's outstanding businessmen for more than twenty years, his name was synonymous with coal and ice distribution. Arthur Bundy (A. B.) Pounds was born in Cabarrus County in 1879 to John Taylor Pounds and Laura Katherine Dove and had lived most of his life in Concord. He was married on Christmas eve 1901 to Annie Misenheimer and had two sons, Frank and Carl, and a daughter Emily. One of his earliest business successes was as an oil distributor, and then later as a coal and wood dealer. For many years Pounds served on the directorate of Cabarrus Bank & Trust Company and was also affiliated with the Imperial Cotton Mills of Edenton, Georgia. He and his family lived on West Corbin, but also had a stock raising farm near Salisbury called Edgewood. As an economically minded businessman, Pounds had diversified his coal and wood fuel distribution business to include ice. Ice was widely sold to consumers for food preservation before the age of in-home electric refrigeration. 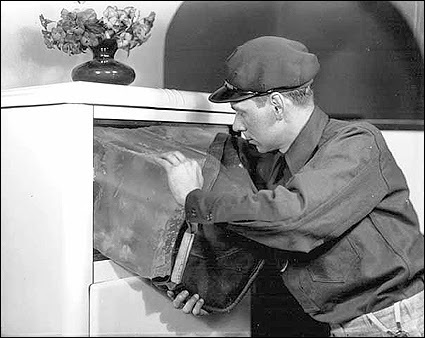 Home iceboxes date back to the days of ice harvesting, which had hit an industrial high that ran from the mid-nineteenth century to the 1930s. Ice was harvested in winter from snow-packed areas or frozen lakes, stored in ice houses and delivered domestically as iceboxes become more common. As early mechanical refrigerators became available, they were installed in large industrial plants producing ice for home delivery. The ability to produce clean, sanitary ice year-round gradually replaced ice harvested from ponds and lakes. Icemen, such as those working for Pounds, would make daily rounds delivering ice from a wagon, cart, or later a truck. Pounds' ice business grew. By October of 1913, Refrigerating World Magazine reported that Pounds was having plans prepared for an ice plant to be erected on West Corbin Street in the heart of downtown Concord, allowing production to increase from 10 tons daily to 22 tons. In April of 1915, Pounds advertised the recent enlargement of his ice plant. He said that with the hot weather coming, ice made in Concord was better than buying ice shipped from outside the city. He could guarantee prompt service and better prices than any of the larger towns in the state. Besides, during the summer months, he would work 35 to 40 local men and boys - and more pay rolls is what Concord needed. If the money was all spent locally, it would support the city. Pounds further exclaimed, "It is the duty of all merchants and business men to boost the manufacturing plants of the city and I hope to receive the hearty support of all who live here." During WWI, Pounds was told that his coal supply would be redirected in support of the war. He turned to the further expansion of the ice operation. In August of 1922 it was announced that he would install a 25-ton electric drive ice plant. About 1928, he sold his ice business to the American Service Company, where his son Frank was appointed business manager. On that fateful day in October of 1933, A. B. Pounds telephoned his son Frank at his office at American Service Company and said he was coming to see him. Pounds had recently been in ill health and was known to have a history of domestic problems and business differences with Frank. For an undisclosed reason, A. B. attacked Frank and bludgeoned him with a stick. After receiving head wounds, Frank shot him in self defense. Sadly, A. B. did not survive. Frank was released after a hospital stay and short time in jail. A. B. Pounds and Annie Misenheimer Pounds Caswell are buried in Concord's Oakwood Cemetery. Frank later worked in real estate and went on to be a veteran of WWII. "American Farm Yard - Evening," Currier and Ives, 1857. Library of Congress. Previous blog articles have discussed William Shakespeare Harris' twelve-page, hand written essay titled "Essay on Agriculture" (9 Apr 2014 and 30 May 2014). 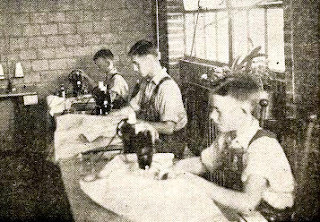 The essay details early life in Cabarrus County, including crops, farming and building techniques, clothing and lifestyle. Presumably, Harris learned much through his own experiences and those of elder Harris family members. Unfortunately, the date and circumstances of the essay are unknown. However, William Shakespeare Harris seems to have written the essay in response to a request from another party, most likely between 1850 and 1875 after Harris had farmed for a number of years. After the passing of his first wife Elizabeth Torrence Powe in 1849, William Shakespeare Harris married Jane Witherspoon Ervin about 1851. They had at least four children, listed in the 1870 census as E. Ervin, age 13; Charles J., age 11; Brevard E., age 8; and Jane E., age 6. William Shakespeare Harris (1815-1875), Elizabeth Powe Harris (1824-1849) and Jane Ervin Harris (1825-1890) are buried at Poplar Tent Presbyterian Church Cemetery in Concord, where Harris served as Church Elder for 26 years. frame addition forming an "L" shaped dwelling, about 1840. The Agricultural Census schedules of 1850-1870 show Harris' successes in farming. In 1850, Harris liste 840 acres, with his farm valued at $8,000. 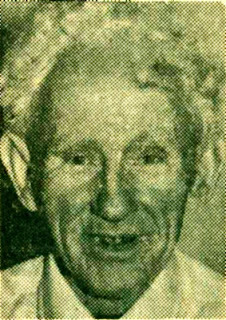 He kept 8 horses, 12 milk cows, 14 other cattle, 25 sheep and 107 swine. His largest crop was Indian corn, but he also grew wheat and oats. In 1860, his holdings expanded to 915 acres, still valued at $8,000. he kept 7 horses, 9 mules, 12 milk cows, 18 other cattle, 20 sheep and 100 swine. Indian corn was still his largest crop; although he added some cotton and increased his wheat production. His oat harvest remained the same. Harris had 48 slaves. By 1870, the Harris farm decreased in size, probably due to the post Civil War economic depression. Harris owned only 455 acres valued at $4,000, 1 horse, 3 milk cows, 7 other cattle, 10 sheep and 9 swine. He no longer produced oats, and his wheat, Indian corn and cotton productions all were down by half. Despite the decline, Harris still ranked as a fairly prosperous Cabarrus farmer and his essay is worthy of consideration for its details on agriculture and many other aspects of life in Cabarrus County. In one passage, Harris describes the land as it appeared to the earliest settlers in the area: they found "a wilderness of cane, through which they cut their pathways with hatches brought with them from Pennsylvania...such was the exuberance of the virgin soil--that the pathways would fill up every spring--the tread of a sparse population and few domestic animals not being sufficient to keep them open...The timber...was principally large trees but was abundant enough for fuel and building." Early houses were built of "exceedingly ponderous" logs, "preserved through a century of time," and "covered with boards secured against the wind and storm." It was expensive and very difficult to get nails. In later years, some houses had thatched roofs: "When farmers began to raise rye, they adopted the quaint mode of covering their farm houses with rye straw. So thoroughly thatched and laid in parallel [sic], that such roofs have been known to last 70 years. 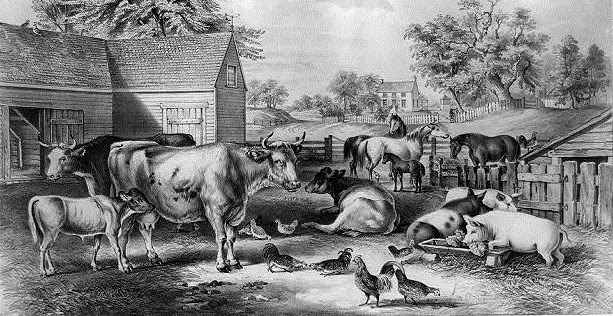 William Shakespeare Harris' "Essay on Agriculture" reveals much more about everyday experiences and way of life of early Cabarrus county settlers. The entire essay is available in the Concord Library Lore Local History Room. Courtesy of the Concord Library Lore Local History Room. Sept. 30, 1863). 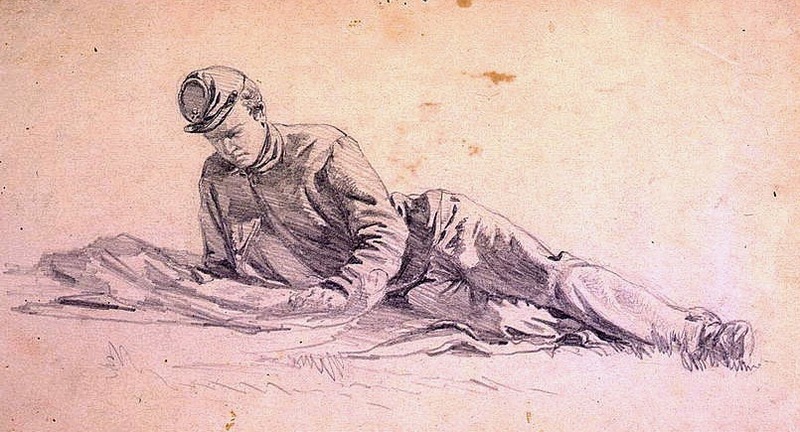 Pencil drawing by Edwin Forbes, 1863. Today marks the sesquicentennial of the The Battle of Appomattox Court House, fought on the morning of April 9, 1865, and the subsequent surrender of Confederate Army general Robert E. Lee's Army of Northern Virginia to the Union Army under Lt. Gen. Ulysses S. Grant. The signing of the surrender documents occurred in the parlor of the house owned by Wilmer McLean on the afternoon of April 9. On April 12, a formal ceremony marked the disbandment of the Army of Northern Virginia and the parole of its officers and men, effectively ending the war in Virginia. This event triggered a series of surrenders across the south, signaling the end of the war. The author of the letter reprinted below was Richard Martin Patterson (1830-1909), a farmer and carpenter from northwestern Cabarrus County. He was married to Mary Ann Propst on 16 Feb 1854. They had five children. Richard and Mary are buried in Center Grove Lutheran Cemetery in Kannapolis. Patterson served in the 52nd Regiment, North Carolina, which fought at Gettysburg in 1863 and surrendered at Appomattox Court House in 1865. Patterson's letter has been reproduced with his own spelling and lack of punctuation. 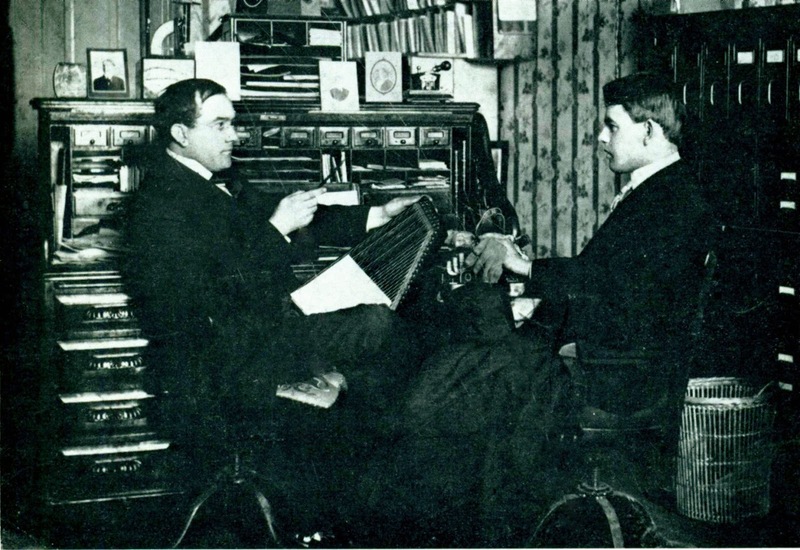 Bascom Umberger in his office instructing a salesman. The office was upstairs on the corner of Union Street, S. and Barbrick Avenue. The following article contains excerpts from the June 1974 issue of Progress Magazine, produced by the Concord Telephone Company. 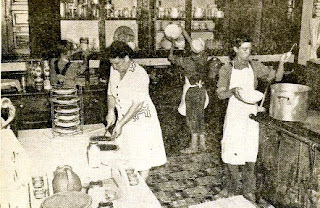 About 1905, an enterprising and ambitious young man by the name of Bascom Leonard Umberger established a new business in Concord called The Home Educational Company. He was vitally interested in education, and his new enterprise sold and distributed books and other educational materials in North Carolina and several adjacent states. Included in the activities of this new establishment was the promotion and sale of a stringed musical instrument known as the "Mandolin-Guitar Harp." of chords occur in groups. 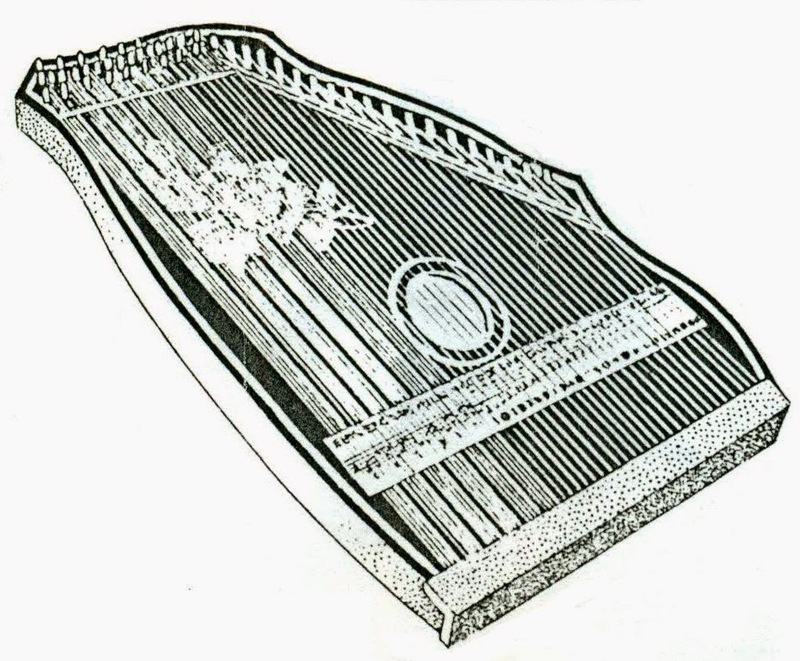 The Mandolin-Guitar Harp, a type of modern chord zither, was actually manufactured by the Phonoharp Company, of East Boston Massachusetts. In spite of its beautiful tone and appearance, and the ease in which it could be played, the harp was was not selling. About the time the manufacturer was considering its discontinuation, it was discovered by Bascom Umberger. Since he had sold books door to door during his summer vacations from college, the idea came to him that if he had salesmen to take this harp to the home and show how even the children could play tunes on it, the harp should sell. After working out an arrangement with the manufacturer to be an exclusive representative, he set up a business in Concord under the name The Home Educational Company. His first move was to visit some of the colleges and engage students who would work on commission selling harps over summer vacation in order to finance their education. Soon the business grew and there were hundreds of men in the field each summer, in addition to a number of men who worked for the company the year-round. These sales representatives worked in various locations across the country. Bascom Umberger enjoyed successful and lucrative business until the tide changed in 1913. Mr. Umberger suffered an illness that hospitalized him in New York for some months. Although he recovered, 1914 proved to be a fateful year for The Home Educational Company. An economic slump occured when World War I broke out in Europe. The draft then called the young men into service who otherwise might have been his sales representatives. These conditions along with the worsening physical condition of Mr. Umberger finally ended the existence of The Home Educational Company. Umberger family home "The Luberger Place." Bascom Umberger was born December 16, 1872 in Wytheville, Virginia. He was the son of Abraham Umberger, a Confederate Civil War veteran, and Elizabeth Martin Umberger. 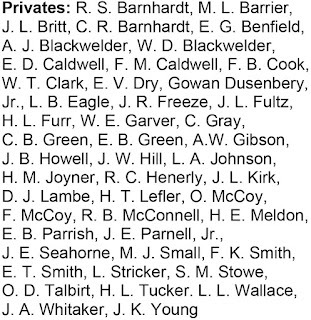 In 1899 he married the lovely Miss Jennie Bell Ludwig of Number 4 Township (now part of Kannapolis), Cabarrus County. Mr. and Mrs. Umberger built a beautiful home atop a ridge near Cook's Crossing, Number 4 Township, and named it "The Luberger Place." This home was destined to survive for more than one-half century and to be occupied solely by the Umberger family. The building was demolished in 1971. Mr. Umberger was active in all phases of religious and civic life in the Winecoff community. He served as a member of the school committee and was very active in Mt. Olivet Methodist Church. He was gifted with a rich tenor voice and could play many musical instruments. His talents were in great demand. He was principal in the development of the Parkwood Community and was a member of the Citizen's Bank & Trust Company Board of Directors. It is thought that he owned the first automobile in Cabarrus County and organized the first Boy Scout troop in the county (excluding the City of Concord). Along with Mr. C. J. W. Goodman and Mr. Will M. Barnhardt, Mr. Umberger was instrumental in securing the first telephone and electric service in the community. Today, very few people in Concord have heard of The Home Educational Company, or even knew of its existence when at its height, because most of its operation was carried on in distant locations, and most of its salesmen lived elsewhere. Noted singer and musician Barbara Mandrell is known to own one of the mandolin-guitar harps, given to her from an admirer. Somewhere, sometime, it was sold by one of Mr. Umberger's traveling salesmen. 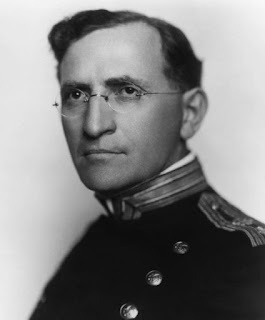 Bascom Umberger died in 1929. Jennie Ludwig Umberger survived him until 1968. They, as well as other family members, are buried at Mount Olivet United Methodist Church Cemetery in Concord.